"I knew she deserved a good home and deserved better than what she had and I knew I could provide that for her." It happened during a traffic stop. Her leg sticking out from under the passenger seat. Officer Jeffrey Emerich said the seven-week-old, blue-eyed Australian Shepherd was shaking, and covered in her own urine. The 4th Division officers arrested Dezmond Jones, 24 for Animal Cruelty. He also had warrants out for harassment and burglary charges. Jones pleaded guilty to animal cruelty on March 20. 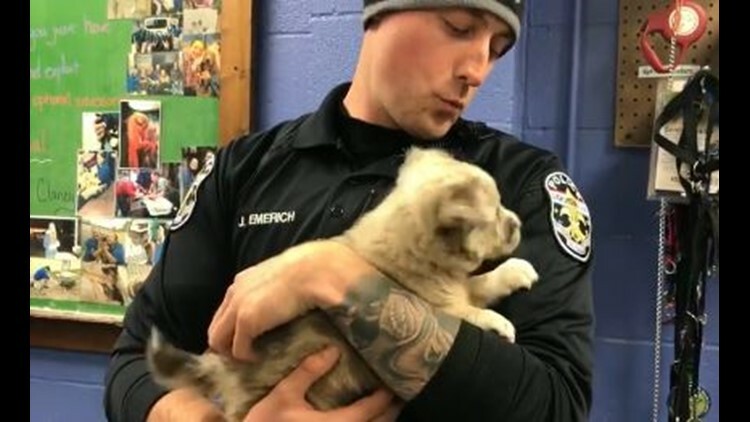 Only two days after the court date, Officer Emerich got a call from Louisville Metro Animal Services. The puppy was in better condition and ready to be adopted. “Being able to get that pet back to him, unbelievable, a lot of times we don't always have happy endings, and with this one we did,” said LMAS Director, Ozzy Gibson. Officer Emerich signed the adoption papers, and is now able to call the pup his own. “I knew she deserved a good home and deserved better than what she had and I knew I could provide that for her,” he said. He plans to name her Audrey, after his grandmother. Emerich is known for his acts of kindness around Louisville. In March, a picture went viral of him putting shoes on a homeless woman. Then, in November, he gave a young girl a new bicycle. “I'm glad to be a part of the whole system of putting the bad guy behind bars and saving people that deserve to be saved,” he explained. Emerich has two other rescue dogs at home and said he is excited to introduce Audrey to the family.